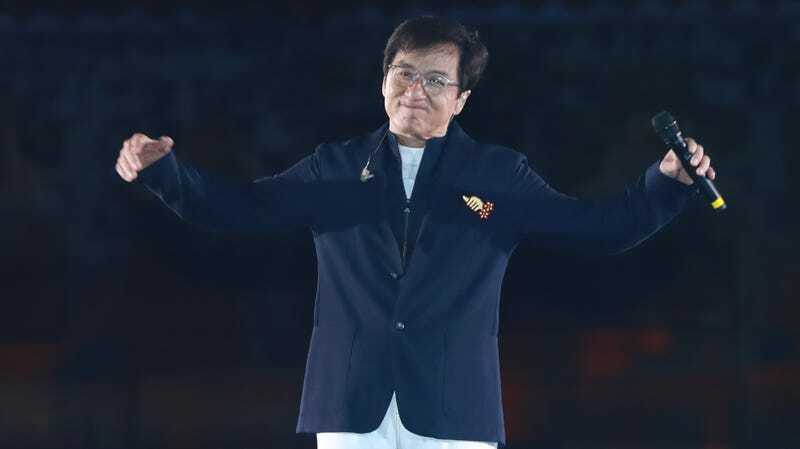 Jackie Chan is an international treasure, an action-movie icon and lovable scamp whose commitment to almost dying in horrifying ways, over and over, for our entertainment, surely qualifies him for some sort of medal. Other than the lifetime achievement Academy Award he’s already received, we mean. But more importantly, we must keep this man safe. Safe from harm, safe from sadness, but most of all, safe from enormous mudslides that almost wipe out Chan and his entire film crew. Such was the most recent threat to the actor’s well-being, as Variety reports a massive mudslide hit the set of his latest film. Chan was filming Project X, a new action-thriller costarring John Cena, when an abrupt weather change triggered the natural disaster and stranded several production trucks in a rushing river of mud. Luckily, Chan and his team escaped unharmed, and the trucks were successfully hauled to safety. The film follows a pair of former special-forces soldiers tasked with helping some Middle East oil refinery workers escape to the relative safety of the Green Zone. It’s shooting in China, and while the exact production location hasn’t been disclosed, large areas in Southwest China have seen heavy flooding this summer, resulting in landslides of the kind he describes. Now, how to ensure this doesn’t happen again? Frankly, God should have known better.